Blackheads are one of the annoying skin problems other than acne. Although his form is relatively invisible when compared with acne, but blackheads make our face look dirty and unsightly especially if it is severe and does not get appropriate treatment. Therefore, many people are looking for ways to overcome the blackheads so that the face looks clean and does not interfere with the overall appearance. Blackheads form because our pores clogged due to dead skin and oil accumulate. There are several ways to deal with blackheads, we can use natural ingredients and do it yourself at home or come to the clinic for facial beauty treatment in order to get what we need. Here's how to cope with blackheads that we can try to apply. Stay tune! It's important before we do care tackle blackheads on our face. 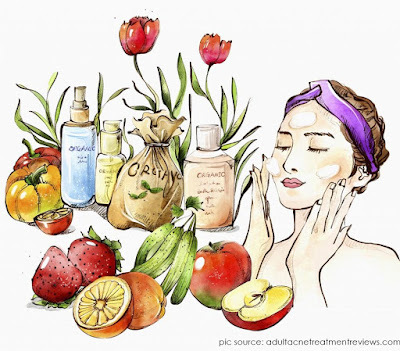 We should know in advance the type of our skin if we have oily skin, normal, dry or sensitive. This type of skin needs to be sure because of the many skin care products available are often good for the skin types but may not be suitable for other skin types. If your skin is sensitive type then we can choose a product that contains salicylic acid. Products with this content prevents your skin from irritation and dryness. Salicylic acid is more gentle on the skin and are rarely the cause of skin reddening and peeling, so no need to worry about its effect. Clean & Clear daily pore cleanser containing salicylic acid that is friendly to sensitive skin while helping us cope with blackheads. If our skin-type are normal, then we can easily choose the products on the market because a lot of that can be used by our skin type. But if we have oily skin, then we can use products that contain oil control. Treatment at home is favored by many people because it is easier and cheaper to use ingredients that already have at home. But we also have to understand that home care is the result of hereditary experience so normally there is no research to discuss and ensure results. The advantage is safe for our skin because it uses natural ingredients. But if the allergy arises then discontinue use. Some examples of treatments that eliminate or reduce blackheads can we do at home is to make a mask of egg white and apply on the face. A protein found in egg whites is believed to kill bacteria. We can also try the honey is heated. Honey has antiseptic and antibacterial content that could help heal wounds and skin infections. If blackheads on the face still stay there and hard to remove, then that means it's time for us to visit a beauty clinic for facial and consult a dermatologist. Facial helps clear blackheads on your skin in more detail and clean. And consultation with the dermatologist will examine your skin type in more detail and will provide the type of care that is best suited to your skin in order to tackle stubborn blackheads that difficult to lose it. The type of treatment recommended may we get in the nearest beauty shops, pharmacies or natural means.